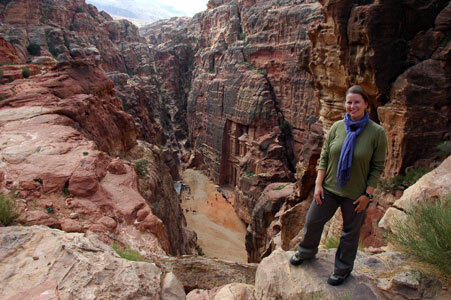 Petra is an ancient city carved into the faces of the mountains of Southern Jordan. It went through many reincarnations as trade routes and invaders came and went. When the Romans found it they contributed a colonnade street and extended the theater and some early Christians left behind a mosaic-tiled church. Still, the earlier carved tombs are what Petra is known for, in particular The Treasury, which was featured in the film Indiana Jones and The Last Crusade. 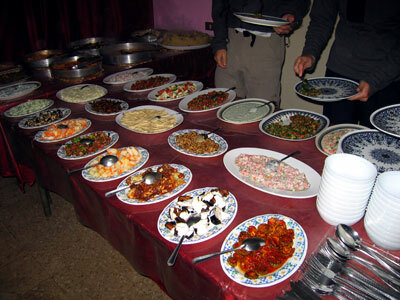 To the dismay of the hotel staff I watched Indiana Jones the night before my first day in Jordan. It was much campier than I remembered and Petra only made it’s way into the film at the very end. Still, it got me excited for my first glimpse of the ancient city. I got a ride from the hotel down to the site at seven the next morning, hoping for an early start to avoid the tour groups. I wasn’t the first person into the site but as I walked along the ten minute approach to The Siq I found myself among compassionate company who wanted the same quiet experience. My good mood couldn’t be broken by the young guys near the entrance yelling “want a horse laydee?” At least they weren’t calling me Madam for a change! I found the touts surprisingly few for a site as important as this. Part of this was probably because February is still low season and it was freezing. 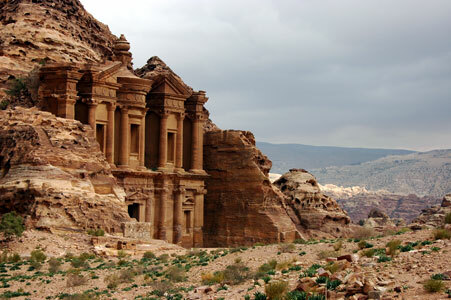 I also now realize that Petra might not be quite as well-known or iconic as I assumed. 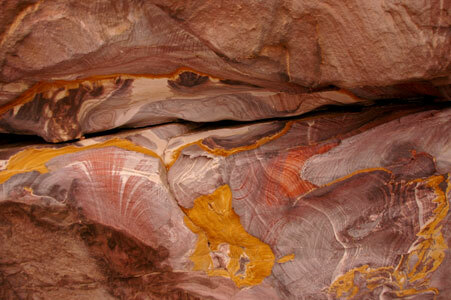 The Siq is a long, narrow passageway between two very tall rock cliffs. It looks like a gorge but was actually caused by tectonic shifts that pulled the rock apart, not a river. It was once paved with a stone floor but only a few spots remain along the sandy, new asphalt path. As I walked along, staring up and noticing the shapes created by the sky, the cliffs and the sun I was tense with anticipation. 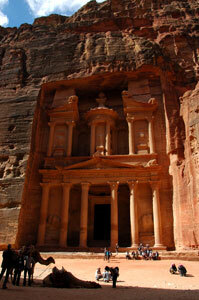 I was waiting for my first glimpse of The Treasury, marking the entrance to Petra. Turning each corner with excitement I wasn’t prepared when I suddenly realized the slightly pink light in front of me was opening up to the columns and chipped sculptures fronting the iconic monument. 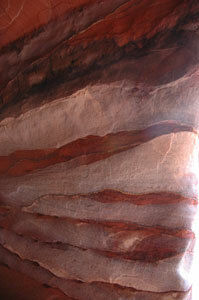 I stood alone in the dark shadows of The Siq, silently taking in the sight. On my way into the rest of the site I was approached by a short Jordanian man whom I’d seen guiding a group of three young English-speaking tourists. I continued to try to get away, waiting for the sell when his group came up and stuck up a conversation. They invited me along and I decided to follow them up the unmarked path above the tombs on the right. This allowed gorgeous views of the theater and a chance to see some beautiful-colored rocks. 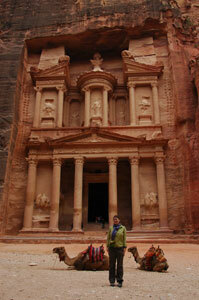 The group were on a whirlwind tour at the end of a business trip to Israel and only had three hours to see Petra. I had three days, so I followed along, vowing to go back and take the customary route through the main thoroughfares of Petra on day two. When the group left (by donkey, after paying the man a shocking 50 Dinar—approximately $70 US), I braced myself for the sell. He followed me down from the church and started pointing out the monuments and explaining their functions during Roman times. It wasn’t anything I hadn’t already read in my guidebook and he was cutting into my exploring time. Even so, when he asked me to tea I agreed, if only as a way to pay him back for letting me tag along. I don’t especially like tea, and I sat through his stories about business and all of his success respectfully waiting until I could leave. My cue was when he began talking about his former girlfriend, an Irish girl, and their relationship problems. I wasn’t interesting in being his new “strong, adventurous girlfriend” and made my way out with only three pleas to take his tour to Wadi Rum. 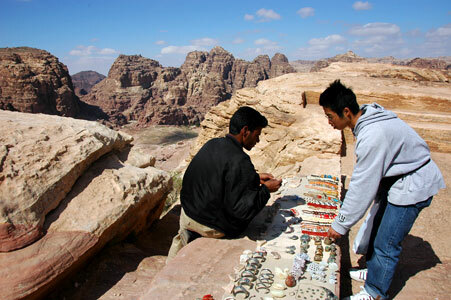 There are a number of carved structures or settled places high above the streets of Petra on the top of the red sandstone hills. Not much for climbing, I decided to tackle one “high place” each day. 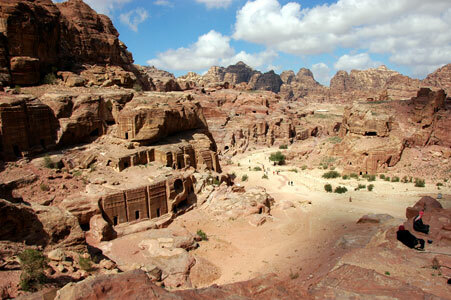 Today’s task was The Monastery, at the far end of Petra and a 35 minute climb up a wide staircase. The path was dotted with Bedouin women selling the same necklaces I’d seen in Tibet and India in-between warming themselves over a fire and feeding their babies. The only man with a booth failed to sell me a donkey ride by telling me the climb takes two hours and scoffed when I asked him to stop lying. He claimed that the climb would take a minimum of one hour and his donkey could get me up in 20 minutes. As a slow walker I made it up in 35 minutes, but couldn’t find him on the way down to settle our wager. The Monastery is a structure similar to The Treasury, but much larger. Sitting at the cafe across from it the building looks small… until someone walks out of the opening and offers a whole new perspective. All but one or two of these “buildings” are totally empty, containing only one large hollow room with no decoration or carving. Their exterior, cut right into the cliff, is the attraction. The exteriors were also apparently painted atop plaster at one time, but all of it has long fallen off leaving ribbons of gorgeous alternating sandstone colors weaving across the surface. By the time I arrived and admired the view the winds had kicked up and an overcast day had turned into a stormy day. Wishing for all the warm accessories I gave away in India I huddled under the cafe’s tent waiting for a break in the weather. Eventually I gave up and wandered into the light rain only to be met with a few minutes of sunshine to take a photo. I wandered beyond the site to see the views looking out toward Israel from the edge of the cliffs. 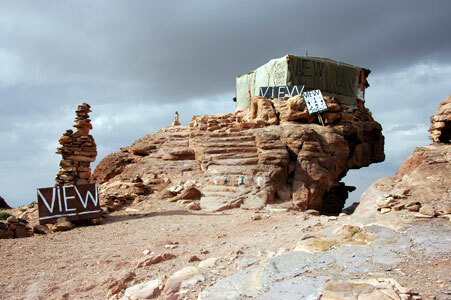 Each viewpoint had been marked with multiple signs by the Bedouins, who had set up tin shack souvenir stalls perched on the edge. The view was cloudy and bleak and I didn’t wan tot buy any jewelry so I made my way back through the entire site to the entrance. 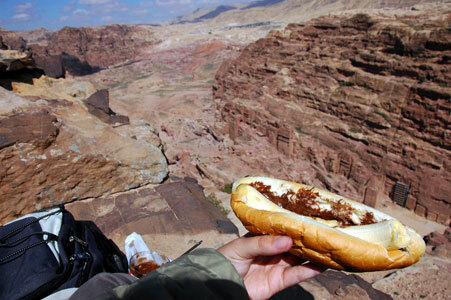 Ten hours inside and I had only seen a tiny sampling of what Petra had to offer. On day two I slept in long enough to miss the free transport down to the site and eventually walked down, stopping for lunch supplies along the way. Still, I reached The Treasury by 9am and took another set of photos with the glowing light of a sunny day ahead. Seizing opportunity again, I took a second cartwheel picture—this time inside The Siq with The Treasury behind. I stood around too long again, admiring the view and watching the tourists interact with their surroundings and each other. I sat down to tea with his family, including his sister who was probably only a few years younger than me. Most of the Bedouin have a little kettle on a tiny open fire going all day. I was almost at the top and continued my climb past the jewelry sellers. Near the top I overheard a women selling an older British couple two necklaces. They negotiated the price down to 20 dinar, and the woman was trying to milk them for more. Most jewelry sellers yell out “two dinar” when you walk by so I’m not sure how this couple got taken for so much. They seemed really happy with their deal and liked the woman so I didn’t say anything. Sometimes I think I would have a better time if I didn’t recognize the scams I see around me. The climb wasn’t too bad, but did take longer than yesterday’s. I was surprised to see so many tourists, and even a tour group or two, at the top. There’s no big monument, only a large rectangular plain stone altar with an interesting drainage system for blood. I stood and watched some Italian tourists lay across the altar and pretend to be sacrificed. Over some boulders I found the edge of the cliff with a full view of The Royal Tombs. I was above, and slightly back from The Theater. An older man in traditional dress rode up on a donkey behind me and asked, in perfect English, if I’d seen his sheep. I hadn’t and I watched as he surveyed the area while talking on his cellphone. I drew for a bit and ate my lunch while tourists streamed through the valley below. A few wandered near my perfect spot but I was mostly undisturbed. It was a clear sunny day and I could have sat up there until sunset. But I carried on, down the back entrance where ceremonies were lead from town. 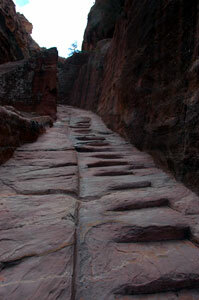 The stairs were mostly original on this route and cut from the side of the cliff. I passed by an interesting fountain of a lion where water from above was harnessed through the mouth and down into a well at the bottom of the cliff. An old Bedouin woman was camped out at this spot and pointed out the lion. I didn’t buy any of her necklaces either, but she let me take a photo of her. 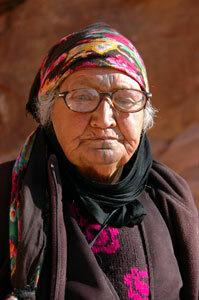 She was the only Bedouin I saw with the traditional facial tattoos. I tried to show her the picture but she just pointed to her eyes which were white with cataracts. I circled around the bottom of the cliff, hoping for a shortcut back to the main road. Misinterpreting a road on my map I ended up high above the road at the base of some second level tombs. I met a woman (also looking for her sheep) who told me I could continue on to The Theater from there. Trusting her, I kept on and shimmied around the rounded boulder blocking my way, thankful for the grip on my hiking boots. From there I only had to navigate a few more boulders and jump down a crevice to make it to The Theater—only I had arrived at the top of The Theater, in a place that didn’t seem possible when I saw it in the morning. On my way back I saw a horse cart driver negotiating a ride with three older Japanese travelers. He was asking 25 dinar ($35) for a ride from The Treasury to the entrance. They were tired and one had a cane—this was extortion. I’m not sure what price they reached, although most offers I heard were closer to 6 dinar (still, an exorbitant sum). When they passed I told the guy not to be so greedy. He didn’t like that and told me to mind my own business. 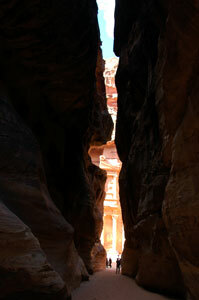 I saw the driver make three more runs while I walked back and left Petra with a bad feeling about the Bedouins there. 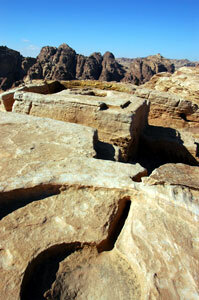 My third day in Petra came after a break to see the desert of Wadi Rum. Four other travelers wanted to leave so I took the opportunity to join the group, spending my last day at Petra after a two day break. It was a cold day, it had rained the day before, and I wasn’t sure how the weather would turn. Because I had walked through The Siq four times by now I decided to take another route, through a different canyon, that would take me around the back side of Petra. The entrance is to the right of The Siq, but as I walked down onto the path a man called after me telling me it was closed. Havig heard these things before I questioned him and analyzed what his motives could be. Two of my Wadi Rum travel mates had taken this route two days before and said it was worth the detour. He was warning me of flash floods and I decided to give in and headed down The Siq, again. I wondered if he was being especially cautious because I was a woman, I was alone, or both. Maybe he was just a nice guy. My plan was to hike to a spot above The Treasury, which is only lit up between nine and ten in the morning. I had to rush through The Siq, past The Treasury, through The Street of Facades and around all of The Royal Tombs before I reached the wide staircase leading up. I was joined on the way up by one middle-aged French tourist and a Bedouin family with one donkey and three dogs. A cave was at the top where the family stayed and the woman pointed us down toward the edge. The path isn’t clear and overgrown with bushes so ti’s hard to find your way. When we reached a section of large boulders we tried three different ways down until finding the easy route that didn’t require 6′ drops that I wouldn’t be able to climb up again. I couldn’t hear anything in the courtyard below until I got right to the edge. From there I heard echos of laughing tour groups and friends directing photo shoots. The French man and I talked about travel and he was surprised to meet an American who was traveling as much as I was. Before he left he told me that I had completely changed his mind about Americans. This actually happens a lot to me, I’m practically a good will ambassador. I sat for a while and drew The Treasury and came out with one of the drawings I’m most proud of on this trip. 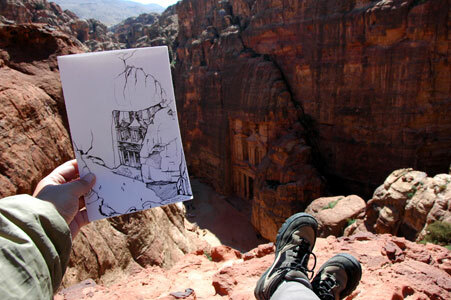 I seemed to be more inspired to draw in Jordan than I have been in a long time. I climbed back up to the cave two and a half hours after leaving and the family was sitting around drinking tea. I showed them my drawing, which they turned upside down and sideways (maybe it’s wasn’t so good after all), and offered me tea. We sat and drank, I showed everyone the photos of my family, house, dog and Halloween that I carry with me and I was invited to a chicken lunch. 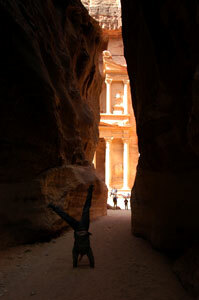 I couldn’t impose and said goodbye with a better impression of Bedouins than day two in Petra. By day three I had seen The Royal Tombs from afar more than once so I quickly walked by and made my way toward the back of the site. I had read about something called “The Painted House” and wanted to find it. Along the way I met my new French friend and showed him my drawing and picked up two guys from my hotel who were hanging around after a trip up to Teh Monastery. We left for The Painted House together and were disappointed to find a small room in a gorge with a few uninspired and simplistic paintings in them. Short of climbing up another hill I had seem most of the site and we made our way back through the collonaded street and Roman additions, past The Theater and The Street of Facades, gave a farewell to The Treasury and emerged at the other end of The Siq felling like it was time to move on. The cold was the most surprising. Even though it is winter, I figured winter in the desert is still hot. I had looked at weather reports for Egypt and expected Jordan to be as hot as Egypt this time of year. I’m wearing my hiking boots, socks, long sleeve shirt and my inner jacket here—even during the day. In Bangalore I seriously considered throwing away my “heavy weight” pants and mailing my coat and boots home. I’m glad I didn’t. I arrived in the small town of Madaba by bus from Amman yesterday and set about looking for groups to visit the surrounding sites. But, because it is off-season, the only people here are in tour groups or have rented cars. Luckily, an American couple showed up last night and we agreed to take a taxi to The Dead Sea and Mount Nebo today. After eating breakfast (boiled egg, breda and tea) in my hotel owner’s house upstairs we hopped into Saleem’s car and were at Mt. Nebo in notime. Jordan’s valleys are surprisingly green and the view was pretty. Unfortunately, we didn’t get the full effect—it was too cloudy to see “the promised land” like Moses did. But I did a cartwheel and watched a group of Japanese tourists glance at the church’s ancient mosaics before pouncing on the postcard display. These mosaics were quite good, including hunting scenes with ostriches, a giraffe and a lion. I thought they were as good as the mosaics I saw in Madaba itself, which is what the town is known for. We hurried back into the car for the downhill ride to the sea. This ride was longer and we had to stop for herders crossing the road with sheep. There are about three military checkpoints along the road but we were waved by all but one. Saleem parked at Amman Beach, which costs 5 Dinar a head but has showers and other facilities. I didn’t want to get back into the car without washing off first. I decided to do the Jordanian thing and swim in my clothing. I don’t think the locals are ready to see my chest in a bikini. We left our bags by the edge of the water and wandered in, walking on sharp rocks and then even sharper solidified salt. Saleem instructed us “slowly, slowly” and I sank back into the water without a splash. The sensation is hard to describe. I was able to float on my back and front and even stand in the water without my feet touching. If this is what the Bible meant when Jesus walked on water he totally cheated! I could barely make out the Israeli side through the haze and was content to flat around and twist around in strange but entertaining barrel rolls. At one point a black chopper flew by twenty feet above and the locals told us it was Americans. While we looked for mud a girl ten feet away started splashing frantically. Her friends saw me and pointed so I laughed and swam over to the “drowning” girl. She must have fallen in while her friends stood by the shore. Her scarf was covering her face as she twisted and turned, splashing her arms. I yelled “put your feet down!” but she didn’t speak English. Finally I reached her and pulled her up (man, I’m strong) and carried her over to her friends just as the lifeguard arrived. Yes, there are lifeguards at a sea that is too salty to actually drown in. She coughed and blew snot and cried while I swam away, unthanked but slightly amused. I’m a terrible swimmer so the idea of me saving someone from drowning is pretty funny. Saleem waded out into the depths and found some mud for us and took a lot of pleasure in rubbing it over my arms and face before a policeman took him aside. He didn’t pay the enterance fee (1 Dinar for locals). After ten minutes drying off we washed the mud off, avoiding our eyes, and then took showers while being stared at by teenage girls. After this long on the road I don’t always appreciate the history or significance of a place as much as I should, but I still had a great time. After three days in transit from Bangalore, including a 24-hour train ride, a 1am airport appearance and a brief layover in Kuwait, I have finally arrived in Jordan. More importantly, I got out of India. I don’t think I’ve talked much about my frustrations in India here, because when I was so angry I had to clench my fists at my side not to hit someone I was in no shape to be composing blog posts. India is not a hard country to travel in. In fact, it was one of the easiest I’ve been to. Most people speak English, there’s a comprehensive transportation system and it’s inexpensive. But the every day hassles I had to deal with wore me down. After the first month of “rickshaw madams” and “your countries” I was becoming violent. Even though I’ve been to countries where everyone wants to know where you’re from (Uzbekistan comes to mind), they didn’t continue to talk to you and tell you everything they think about anything without letting you speak. When I did speak or beg off I was usally told I was wrong or yelled at for not being interested in the locals and so on. More than that, I can’t stand being told what to do. Generally, when someone gives me unsolicited advice (“sit down, go there, eat this”) I automatically want to do the opposite. This lead to many situations in which I got into an argument with an Indian man because I wouldn’t sit down. Sometimes I would be walking straight down a street and a man would come up and point the way I was walking and say “yes, that way.” I would have to find some side street to turn off of just to prove him wrong! Add to that horribly greasy and/or spicy food, pollution and a population that apparently can not tell the truth and I was out. If I had left after the first month I think I could still look back fondly of the sites I saw and the few nice people I met. Even though the South was much more hassle-free I still got into a physical alteration with a drunk rickshaw driver in Fort Chochin and yelled at people in Bangalore. In my mind I kept hearing those people who say “you’ll either love India or you’ll hate it.” I struggled with that statement because I didn’t hate India and I didn’t love India. Mostly I was just undwhelmed and dissapointed by it. In the end it’s just better for both me and India that we’ve parted ways. Jordan is a breath of “fresh” air compared to India and I’m excited to be in a country smaller than the state of Virginia with plenty of really old, really important sites—all more or less on the way to Egypt. I’ve already bought my red and white checkered head scarf and Iraqi Dinar with Saddam’s picture on it. For lunch today I had a grilled chicken wrap with avacado, salsa and fresh sour cream. Sure, it cost more than my hotel room but it wasn’t Paneer Butter Masala. When I arrived at 3pm yesterday I immediately went to sleep and didn’t wake up until 6 the next morning. The hotel staff later admitted that they were worried about me, that something was wrong, but they soon realized I just had to sleep India off.